There’s a chill in the air and a nip at my nose, and we’re slowly coming to the point at which I can’t leave the house with wet hair lest I end up walking around with an icicle helmet on my head. Winter, must you come again so soon? This recipe is pretty standard; I found similar versions on Chow Vegan, Choose Veg and The Vegetarian Times, and tweaked them to my own fussy liking. Even though I loathe the stuff, I left celery in the recipe, because chances are that you dig it. But my protest, I’m registering it. I WOULD RATHER BE SHOT IN THE FACE THAN EAT THIS STUPID FOOD. The celery, I mean. 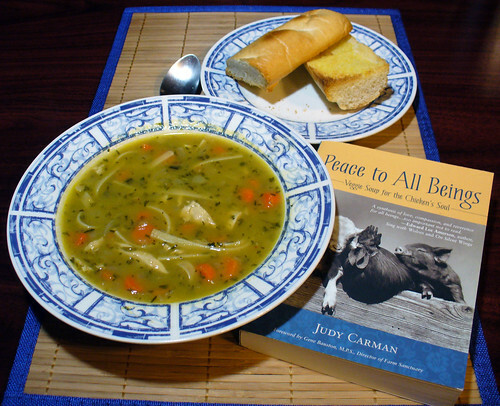 The Vegan Chicken Noodle Soup? Warms the soul, baby (yours and the chicken’s!). 1. Heat the olive oil in a large pot on medium heat. Add the onions and leeks and sauté until almost translucent. Add the carrots and celery and sauté for another five minutes, or until almost tender. 2. Add the bouillon broth, onion powder, salt and pepper and bay leaves. Increase the heat and bring the soup to a boil, then reduce to medium and simmer for five minutes or so. 3. Add the Gardein chick’n filets, parsley and noodles. Increase the heat and bring the soup to a boil a second time, then reduce the heat and let simmer for ten minutes, or until the noodles are tender. 4. Serve warm, but remember to remove the bay leaves first! We forgot the soup crackers, but the impromptu garlic toast tasted even better. Happy accidents! This entry was posted on Sunday, October 23rd, 2011 at 2:30 pm. You can follow any responses to this entry through the RSS 2.0 feed. You can leave a response, or trackback from your own site. This looks amazing! I almost can’t wait until I get a cold so that I can make this! Thanks everyone! 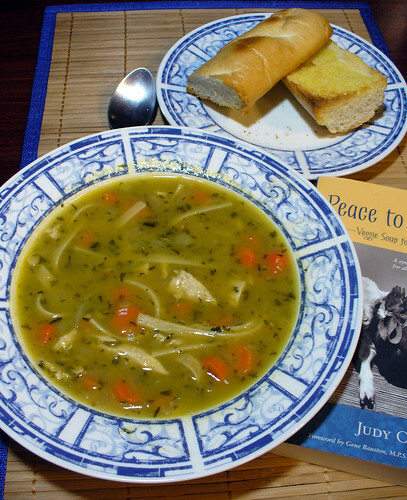 This one definitely replaces the spicy three bean soup as my favorite soup recipe. Delish!